Rumblings of September 11, 2001 still echo across the country - even six plus years later - and sometimes in peculiar ways. Little did I realize that a seemingly innocent trip to Winsted Town Hall would not only turn into fodder for the website, but also lead to some interesting contemplation, analysis and laughs. Such is life, and as I find out more and more, such is Winsted. The task at hand was simple enough: pick up an appeal application form from the tax assessor's office. But upon opening the front door to Town Hall and walking inside, I noticed on the right hand wall of the entranceway was The Sign. Being a good citizen some of the time, I read The Sign and contemplated it. Then I read it again - mainly because I found it so ridiculous and the message unnecessarily obvious. I shook my head in disbelief, muttered "nice greeting" under my breath, and went on with my appointed rounds. When leaving, I again noted The Sign and suddenly thought it might be interesting to share a photo of it with visitors to the website. A day later I was on two missions. Number one: submit the completed appeal application form. Number two: take a photo of The Sign. These missions went as certain bodily functions sometimes do: number one went easy, but number two took some work. Let me explain. After a quick visit to the assessor's office, I was standing in front of The Sign about to whip out the camera to snap a photo. Suddenly a select string of news stories relating to security flashed through my mind, which prompted me to ponder: what if some obsure or arcane law had been passed in the post-911 homeland security frenzy that made taking a photograph inside a federal, state or municipal building a potential security breach, and therefore a crime? Was I about to commit a criminal act? There wasn't another Sign posted stating such, but that didn't make me feel more, uh ... secure. I felt like the fella in the upper left hand corner of this webpage. 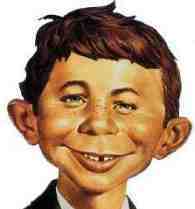 And in the slightly modified, immortal words of Alfred E. Neuman, I thought, "What, me paranoid?" 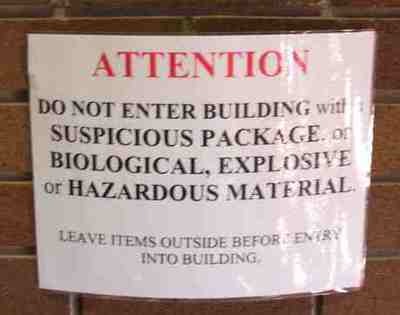 Me: "This may all seem very silly, but you know that sign in the main entranceway about not bringing biological, explosive or hazardous objects into the building?" Officer offers a silent, suspicious stare. Me: "Well, I just wanted to take a picture of the sign and didn't know if there was some law against doing so." Officer: "As far as I know, there's no law against that." Me: "Okay, thanks. Just wanted to make sure." Officer: "Go ahead. I don't see any problem with that. I just can't understand why anyone would want a photo of that sign." Me: "Oh, I just saw it and thought it was, well ... peculiar. So I wanted to post a photo of it on my website." Officer shakes head in disbelief, bordering on disgust. Definitely not detective material - didn't even ask for website URL. Me: "Thanks again! Appreciate your time." I turned around, but as I was walking out the officer added, "There's another one of those signs by OUR entranceway, too." That pretty much faithfully records the drama. I took a couple of photos, remained unaccosted and left. But when it came time to write a little explanation of the photo, I got to thinking about the words on The Sign. Lets break it down for analysis, shall we? Suspicious means openly distrustful and unwilling to confide; or not as expected. Biological pertains to biology or to life and living things; or parents and children; related by blood. Explosive describes something tending or serving to explode or characterized by explosion or sudden outburst; liable to lead to sudden change or violence; sudden and loud; or a noun for a chemical substance that undergoes a rapid chemical change (with the production of gas) on being heated or struck. And hazardous describes something that involves risk or danger. Main Street frequently hosts an interesting cast of characters; many easily classified as suspicious. Isn't human skin just biological material that provides a containment for even more biological matter, some of which regularly thought of as hazardous? Aren't cigarette lighters actually just small, explosive devices? Now consider this: a customer of the Winsted Diner meanders east on Main Street after injesting a piping hot bowl of black bean soup or chili. What's to prevent this person from walking right into Town Hall with a dangerously hyper-bloated colon full of home town, homemade noxious gas and crop dusting the entire second floor hallway and offices? The Sign? I doubt it. This is Winsted, after all.